← Spend a Beautiful Day at Pacific Park Celebrating the 22nd Annual Pier del Sol! Food! Rides! Kennedys! Philanthropy! Just in the nick of time for the commencement of the most witching month out of all 12, some eerily malevolent creature was in the process of nicking time in full ironic parallel with anything and everything reminiscent of sharpened claw to bio-switch blade (Freddy Krueger-style) at the World-Famous Hollywood Museum!!! Yes, to add to the Hollywood Museum’s diverse lexicon of cinematic/televised history, the Dungeon of Doom in the old Max Factor basement is now an additional option by which to experience all chills and thrills. 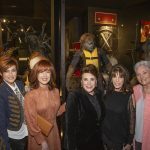 Commencing at the spawning of the age of the most vexing and hexing month sporting 8 proverbial legs into the year, two months before its demise, The Hollywood Museum, in conjunction with the Academy Award ® Winning Studio Amalgamated Dynamics Inc. opened its “30 Years of Make-Up, Monsters & Magic” exhibit!!! Premiering October 2nd, via red carpet, in an evening that was both educational and invocational, master craftsmen and make-up artists alike, schooled in their trade summoned many sculpted demon, while all those in attendance could only beckon them in their mind’s eye…or behind the glass of many-a display case. And if one was lucky, they might have even caught a shape shifting Vulcan type creature or two, mingling with party guests to photographically opportunistic appeal!!! 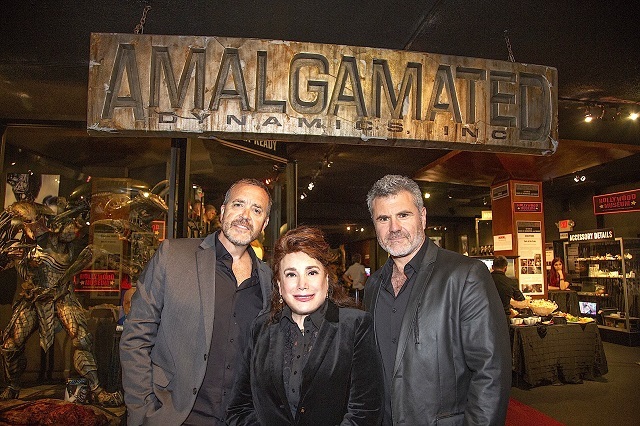 In attendance, at the behest of Hollywood Museum President and Founder Donnelle Dadigan: Founders of Amalgamated Dynamics Inc., Alec Gillis and Tom Woodruff, Jr., E.T. Mom, Cujo/Critters star and all-around Horror beauty Dee Wallace, Mr. Belvedere Mom (not to be confused with Mr. Belvedere’s mom) Ilene Graf, Villain Vixen (and somewhat scary Batman thwarter herself—No joke!) Lee Meriwether, Raj’s Mom a la Big Bang Theory-style Alice Amter, NOT Alice Amter’s son, but Raj’s friend before he became Raj’s friend, Wyatt McClure (aka Young Sheldon), too young to be anybody’s mom, and from Dancing with the Stars Jr.’s Artyon Celestine, The Walking Dead’s (yes, WALKING, ‘cause dead can’t dance) Emma Bell, Valley Girl (and GOOD dancer, of that I am quite certain) along with Kid & Monsters star Lee Purcell, The Middle & The Plague star (but fortunately for her, not in the middle of a plague) Casey Burke, Bosch & FX star Joni Bovil, American Horror Story and Prodigy prodigy Savannah Liles, Get Shorty’s Isaac Keys, Jumanji’s Bradley Pierce, Actor Tien Pham, currently working on a project, being worked on by Amalgamated Dynamics Inc., that has yet to be mentioned (ooh the suspense, but is it because it shall not be named, or for hush hush ol’ legal reasons?) The Brady Bunch’s Susan Olsen, True Blood and General Hospital’s Carolyn Hennessey, My Three Sons’, Tremors’ & Argos’ <<< (to give 3 credits) Barry Livingston, and last but certainly not least (and steadfast supporters of the Hollywood Museum) The Young and the Restless’ Kate Linder, and Award-Winning Producer and Songbook singer Barbara Van Orden! Though the LA Beat didn’t have the heart to tell her that perhaps he was so creepy because he was merely looking for a comfy mattress. “Jack Nicholson in The Shinning when he’s axing his way through the door is pretty good and pretty high on the list… and Alien. The first Alien is the best. The second Alien is good too, but I like the first. LA Beat: I always hate how they do the saliva, like the strings of saliva. LA Beat: It is kinda creepy. ‘Cause it reminds you of maggots. One time I was at work and a maggot almost fell in my coffee ‘cause a rat had died in the ceiling above… Okay now that’s really gross. I’m gonna quit while I’m ahead. LA Beat: So cool! Does he have a name…like Howard or Nunzio or somethin’? Joyner: No he doesn’t… [But I’m thinking it will start with ‘Q’]… This is more of what I would call a character study because as a concept artist and a designer, we tend to do this stuff all the time. We’re kind of driven. So even when I’m not getting paid for it, I’ll be doing it in the evenings or on the weekends… I have about seven or eight of these, but he used to be an old monk, then he was a young monk with a knife like a dagger in a martial arts pose, then he became an orc and now I’ve finished with the lizard man and I think this is what he’s gonna be. So now I can start refining him and then doing the texture and finishing it. 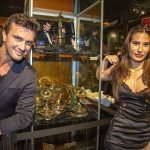 But if I were to do it for a film or a TV show, you would have a design that’s drawn out, and then you would pretty much know what you’re doing [from the get go]. But if it’s going on a human, for like a prosthetic, you just have to bridge that transition from loose concept sketch, to making it fit on a person (LA Beat’s inner commentary: particularly difficult for this piece as it is about the size of a larger, skinnier chihuahua – if that is even possible) and that’s a tough thing ‘cause you’re dealing with all these nooks and crannies. You can’t change an actors eyes or mouth unless you are doing computer graphics (LA Beat’s inner Commentary: so they say and a likely story) or maybe animatronics so you have to try and take into consideration the emotion of the character and have that translate not as much necessarily as the anatomy of the character. 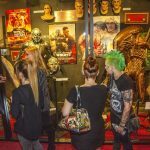 Among the exhibits highlighted films, Amalgamated Dynamics own: Tremors, The Predator, Starship Troopers, and Alien 3, The Nun, IT featuring a complete recreation of Bill Skarsgard in make-up as Pennywise, Jurassic World: Fallen Kingdom one of (probably too many) deadly dolls from Annabelle: Creation, the second chapter in the spin-off from The Conjuring; a finished bust of actor Joel Edgerton in full make-up as rookie cop Orc, Nick Jakoby, from Bright; the 9-foot tall ship’s Pilot Alien Creature removed from the final cut of the 2011 feature for The Thing, a full- size figure of the Predator and Alien from Alien vs. Predator along with the deadly xenomorph from Alien Resurrection as well as a replica of series star Sigourney Weaver along with the 8 -foot tall human/alien hybrid known as the newborn from Alien Resurrection. 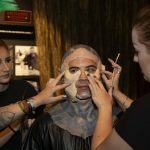 This all accompanying The Hollywood Museum’s permanent fixture this Haunted Day season in the form of The Dungeon of Doom, currently haunting and inhabiting Hollywood Museum’s Basement. Featured Fright Fabrications include: Original costumes culled from Frankenstein, that of Michael Myers as worn in Halloween, along with varying and sundry other garments monster-creatures were thoughtful enough to consider donning before alighting the threshold of their creepy abodes and going out and terrorizing the world: Jason Vorhees of Friday the 13th fame, Freddy Krueger of Nightmare on Elm Street unappeal(? 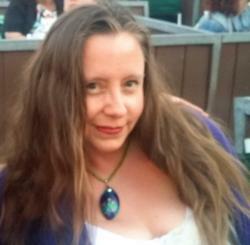 ), to wardrobe from Sweeny Todd, Van Helsing, Underworld, and The Walking Dead. And to top that all off, as if it wasn’t enough Sinister Sensations’ recreation from the set of Silence of the Lambs!!! 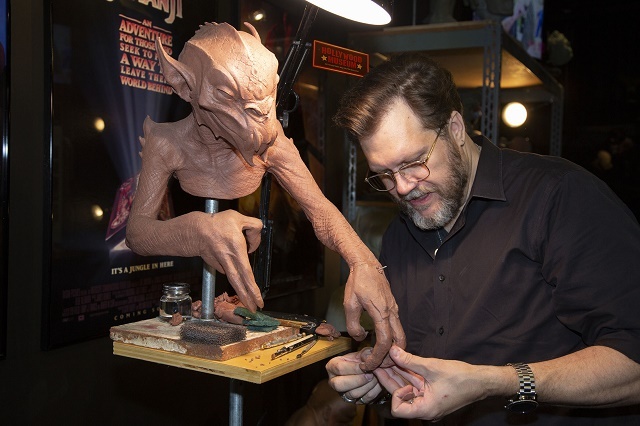 Amalgamated Dynamics current projects include: Godzilla: King of the Monsters, The Cleansing Hour, The Mortuary Collection and Godzilla vs. Kong, so be looking for those at next year’s exhibit!!! “We are thrilled to be paying tribute to a genre in entertainment that has not only withstood the test of time, and grown more popular with every generation. It is particularly poignant for this exhibit to feature these creatures and characters at the Hollywood Museum, where make-up and the magic of make believe began with Hollywood’s make-up king, Max Factor!” Donelle Dadigan could only exclaim and it is evident that this display will go down as one of the Hollywood Museum’s watershed (but not an abandoned creepy one out in the woods or any given black lagoon) moments in history! 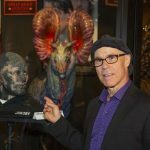 “30 Years of Make-Up, Monsters, & Magic” is on display at The Hollywood Museum October 3rd-December 31st 2018. 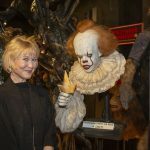 This entry was posted in Attractions, Miscellanious and tagged Celebrities, celebrity, exhibits, Halloween, horror, horror movies, The Hollywood Museum. Bookmark the permalink.